Background: Yoga is considered to be one of the most important, effective, and valuable tools available for man to overcome various physical and psychological problems. Stress contributes significantly to the pathogenesis of periodontal diseases; hence, it becomes important to reduce the level of stress for prevention and management of diseases. Aims and Objectives: The present study was aimed: (1) To understand and analyze the possibilities of employing yogic practices in the treatment of periodontal disease along with conventional dental therapy, (2) to understand the effect of stress on periodontal treatment outcome, (3) to evaluate the efficacy of yoga in the management of periodontal disease with reference to stress. Materials and Methods: An outpatient department-based parallel group randomized study was performed with standard treatment for periodontal disease yoga therapy as Group II and only standard treatment as Group I. Periodontal health status was recorded using indices of modified plaque index (PI), bleeding on probing (BOP), probing depth, and clinical attachment loss (CAL). The Cohen's perceived stress questionnaire was also used to determine stress severity. The yogic intervention consists of lectures and practical sessions on asanas, pranayama, kriyas, and meditation. 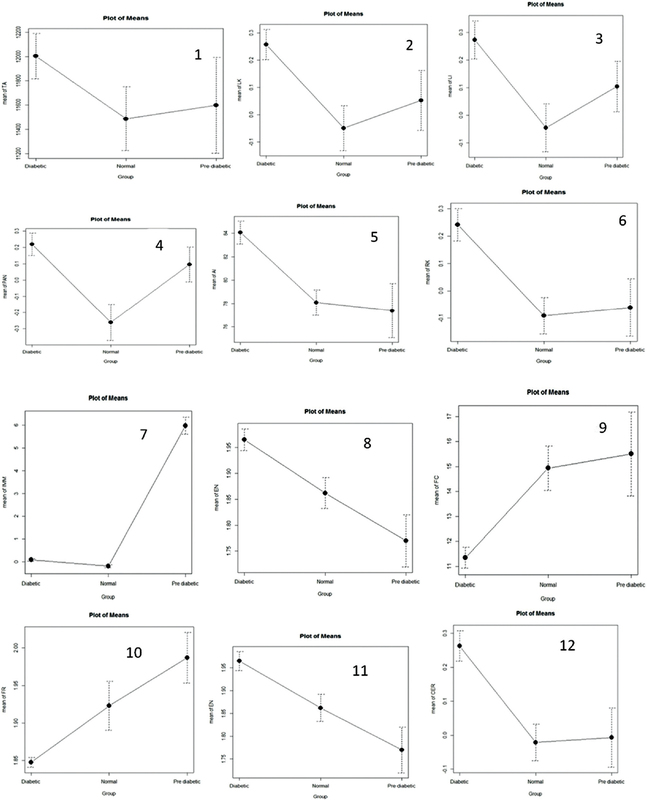 Results: Repeated measure analysis of variance revealed a significant difference (P < 0.001) in all the outcome variables with respect to time in both groups. It was observed that mean PI score reduced by 1.35 in Group II as compared to 0.54 in Group I, mean probing pocket depth reduced by 1.60 in Group II as compared to only 0.68 in Group I, and mean CAL score reduced by 1.60 in Group II as compared to 0.68 in Group I. Similarly, Cohen's perceived stress scale score also reduced by 18.76 points in Group II as compared to only 2.58 points in Group I, BOP also shows better improvement in Group II with a reduction of 0.68 as compared to reduction of only 0.08 in Group I. The results obtained ascertained the role of yoga in stress reduction in periodontal disease. 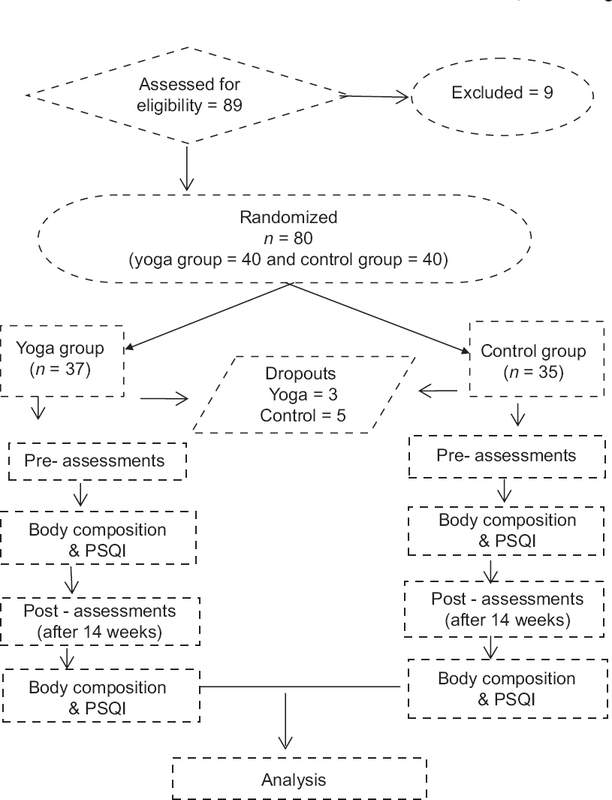 Conclusion: Although yoga does not play a direct role in improving periodontal disease, it accelerates the treatment outcomes by combating the stress which is a major factor affecting the treatment of periodontal disease. Background: Competitive examinations, particularly in mathematics, have made emotional stress a major problem for preuniversity students, emotions like aggression toward fellow students and teachers increase. Mindfulness is a quality that reduces both emotional stress and aggression, so increasing mindfulness should be helpful. Aims: To study the effects of Yoga Pranayama (YP) and Vedic Mathematics (VM) on mindfulness, aggression, and emotion regulation. Methods: Participants were 12th graders attending a preuniversity college in Chikkamagaluru, India, of both genders. Exclusion criteria included major psychological problems. Three classes were arbitrarily assigned to one of three interventions, which consisted of 15 days each of 30 min daily instruction in YP, Group 1, VM, Group 2, or 30 min ordinary class work, Group 3, the control group. Assessments were made using the Mindfulness Attention Awareness Scale, the Nonphysical Aggression Scale from Pittsburgh Youth Study, and the Emotion Regulation Questionnaire. Statistical Analysis Used: SPSS 19.0. Results: Mindfulness, aggression, and negative emotional regulation changed significantly for the YP group, while mindfulness alone improved significantly for the VM group. No group changed on positive emotion regulation. Controls apparently improved on aggression. An interesting post hoc correlation analysis is also reported, among other things directly linking increased mindfulness to decreased aggression. Conclusions: The study showed positive effects of traditional methods of decreasing emotional pressure on students facing preuniversity mathematics examinations. Increasing mindfulness is considered a way of increasing emotion regulation, so the failure of this study to provide evidence for that is of interest. Background: Breathing exercises have been described to be useful in asthma management by few researchers in the past. 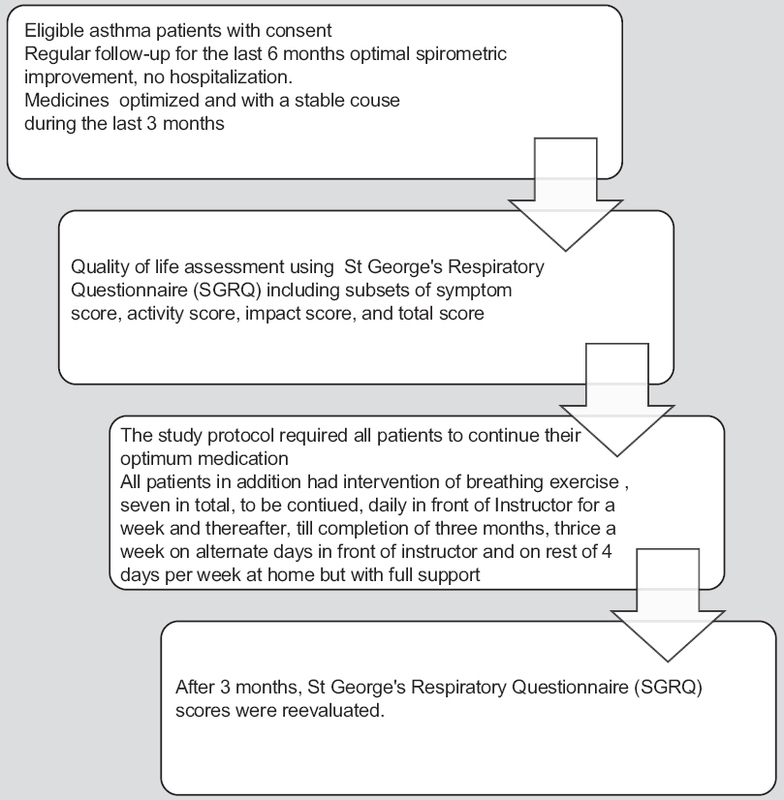 Objective: To assess the efficacy of breathing exercises (Pranayamas) added to regular optimal medications in asthma patients in improving health impairment using St. George's Respiratory Questionnaire (SGRQ). Methods: Sixty stable asthma patients (34 females) receiving optimal treatment at our institute for 3 months or more as per the Global Initiative for Asthma guidelines were included in the study. They performed seven breathing exercises under supervision at yoga center of our institute for 3 months in addition to their regular medications. SGRQ (1 month symptoms version) was used to assess the quality of life before and after breathing exercises intervention for following subsets: Symptom score, activity score, impact score, and total score to assess the efficacy of breathing exercises. Results: Of 60 asthma patients, 34 were females and 26 were males, and their mean age was 25.45 ± 5.41 years. Their baseline spirometric values were as follow: Forced expiratory volume in 1 s (FEV1) - 2.492 ± 0.358 L and peak expiratory flow rate (PEFR) - 283.82 ± 51.12 L/min. The SGRQ scores after breathing exercises intervention decreased from 45.98 ± 5.61 to 38.78 ± 4.92 for symptom subset, from 15.45 ± 3.33 to 12.34 ± 2.39 for activity subset, from 17.95 ± 4.22 to 12.12 ± 3.82 for impact subset, and from 25.83 ± 8.31 to 19.20 ± 7.09 for total scores. All these reductions were statistically highly significant (P < 0.001). Decrease in symptoms, activity, and total SGRQ scores each was significantly correlated with FEV1, FEV1/forced vital capacity (FVC) ratio, and PEFR; decrease in impact score was significantly related only with FEV1/FVC ratio. Conclusions: Breathing exercises significantly decreased all component scores of SGRQ, signifying a global improvement in health impairment due to asthma; this improvement was in addition to that was achieved with optimal asthma therapy alone. Background: Yoga is the most popular form of alternative medicine for the management of diabetes mellitus type 2. The electro-photonic imaging (EPI) is another contribution from alternative medicine in health monitoring. Aim: To evaluate diabetes from EPI perspective. Objectives: (1) Compare various EPI parameters in normal, prediabetic and diabetic patients. (2) Find difference in controlled and uncontrolled diabetes. (3) Study the effect of 7 days diabetes-specific yoga program. Materials and Methods: For the first objective, there were 102 patients (normal 29, prediabetic 13, diabetic 60). In the second study, there were 60 patients (controlled diabetes 27, uncontrolled diabetes 33). 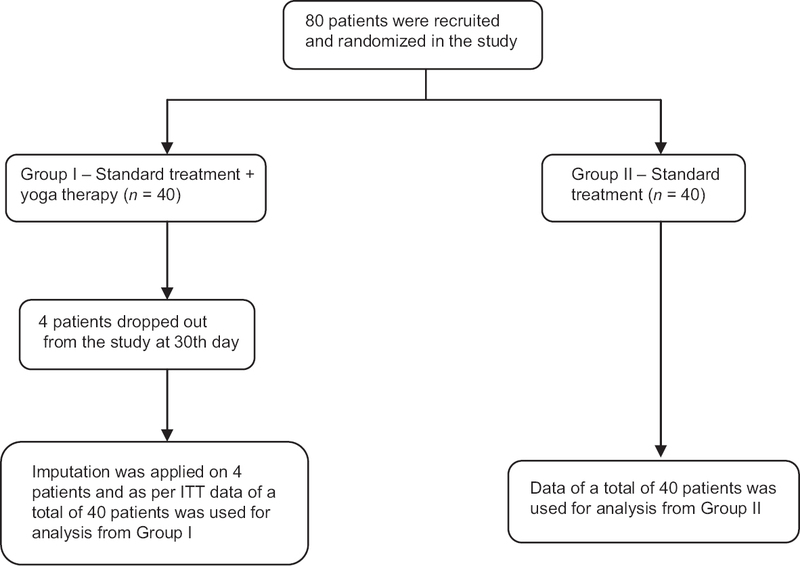 The third study comprised 37 patients. EPI parameters were related to general health as well to specific organs. Results: In the first study, significant difference was observed between (1) Diabetics and normal: average intensity 5.978, form coefficient 3.590, immune organs 0.281 all P < 0.001; (2) Diabetics and prediabetics: average intensity 6.676, form coefficient 4.158, immune organs 5.890 P < 0.032; (3) Normal and prediabetes: immune organs (−6.171 P = 000). In the second study, remarkable difference was in the immune organs (0.201, P = 0.031). In the pre- and post-study, the mean difference was: area 630.37, form coefficient 1.78, entropy 0.03, liver 0.24, pancreas 0.17, coronary vessels 0.11, and left kidney 29, with all P < 0.02. Conclusion: There is a significant difference in EPI parameters between normal, prediabetics and diabetics, the prominent being average intensity, form coefficient, and immune organs. Between controlled and uncontrolled diabetes, immune organs show significant change. Intervention of yoga results in change in most parameters. Background: Popular media typically portray yoga as an exercise or posture practice despite the reality that yoga comprised eight practices (called limbs) including ethical behavior, conscious lifestyle choices, postures, breathing, introspection, concentration, meditation, and wholeness. 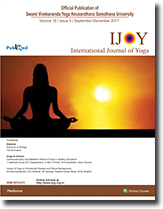 Aim: This study assessed the comprehensiveness of yoga practice as represented in articles in the popular yoga magazine, Yoga Journal. It explored the degree to which articles referenced each of the eight limbs of yoga and other contents (e.g., fitness, spirituality). Materials and Methods: Six coders were trained to reliably and independently review 702 articles in 33 Yoga Journal issues published between 2007 and 2014, coding for the limbs of yoga and other contents. Results: Breathing and postures were most frequently referenced, which were covered in 48.7% and 40.1% of articles.Internal practices were covered in 36.5% of articles with introspection being the most and concentration the least commonly referred to internal practices. Ethical and lifestyle practices were least frequently covered (5.2% and 6.8%). Since 2007, coverage of postures steadily increased, whereas contents related to the other limbs steadily decreased. The most frequent other contents related to fitness (31.7%), spirituality (20.8), and relationships (18.7%) coverage of these did not change across time. Conclusions: Representation of yoga in articles contained in the most popular yoga magazine is heavily biased in favor of physical practices. Recommendations are offered about how to shift media representation of yoga to make the heart of the practice more accessible to individuals who could experience health benefits but currently feel excluded from the practice. Cognitive deficits are reported in diabetes mellitus type 2 (DM2). Previous research has shown that music-based intervention can not only reduce hyperglycemia but also target cognitive functions as well as stress. The aim of this exploratory study was to understand the effect of active participation in music therapy (MT) on the cognitive deficits of DM2 patients. MT of twenty sessions was carried out with three participants with DM2. Serum cortisol, perceived stress, Color Trail Test (1 and 2), and verbal n-back (1 and 2) tests were used to measure the outcomes. Feedback was taken for the subjective ratings and satisfaction of the participants. Stress and cortisol reduced and focused attention and working memory improved in varying degrees. Subjectively, participants reported having benefitted from the intervention. This is the first attempt to investigate the effect of music-based intervention on cognitive function in DM2 patients using case study approach.